Installation initiated by solo performance. On the first day of the installation I sat at a table listening to a metronome; eyes closed and motionless, except for the rewinding of the metronome. I wore a black dining suit, which had been buried for one month prior to the performance. 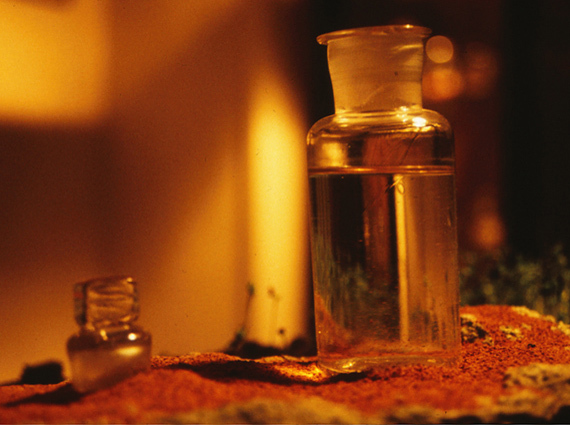 A jar of rain, collected on the 29th November 1996, was placed on the table. At the beginning of the performance this jar was opened. On the walls around the table were a series of framed mixed-media works based on found photographs. A collection of storage jars containing seeds, photographs and objects were locked in a glass museum cabinet. The performance/installation was monitored on CCTV.